*All dimensions shown on website are within 1/8"± tolerances. Cavity capacities are in fluid ounces, within 1/8 fl.oz ±. All mold configurations may be changed by their various manufacturers without notice. We endeavor to make sure that the molds pictured and described are accurate. However, as stock comes in from a manufacturer, the number of cavities per mold may have been reduced or increased. When we catch a change in the mold's configuration we get the new information/pictures up as soon as we can. This change in mold configuration and cavity numbers occurs mostly in the plastic molds. 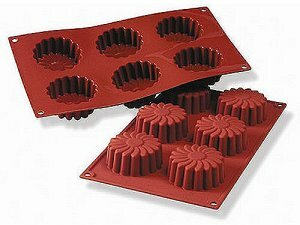 50% OFF REGULAR PRICES ON PLASTIC SHEET MOLDS! Click the "More Info" link of each product to see sale prices. 2-3/4" round, vertical height is 1-1/8". We have found these to work great for all types of soap, paraffin, beeswax, soy candles as well as free standing gel candles. Disclaimer All of our products are offered in good faith, but without guarantee. Due to the variety of industries served, products are sold without warranty, expressed or implied, of any kind. Purchasers will, by their own tests and evaluations, determine suitability of such products for their specific use. We assume no liability for damage and/or injury resulting from the use of products supplied by this company. In no event will we be liable for direct, indirect or consequential damages resulting from loss of use or profits arising out of, or in connection with, the use/suitability of products. Copyright ©1998-Present, Scottcrew Enterprises LLC. All rights reserved.